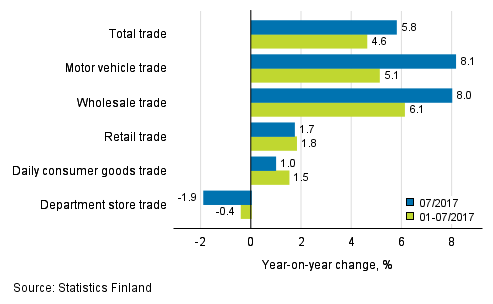 According to Statistics Finland, sales in total trade increased by 5.8 per cent in July from July 2016. Among trade industries, motor vehicle trade and wholesale trade grew most. Sales in motor vehicle trade increased by 8.1 per cent and in wholesale trade by 8.0 per cent year-on-year. Sales in retail trade increased by 1.7 per cent in July from one year ago. Among retail trade industries, daily consumer goods sales grew by 1.0 per cent, whereas sales in department stores contracted by 1.9 per cent from July 2016. The sales volume in retail trade was 1.9 per cent higher in July than in July 2016. Over the same period, the sales volume in wholesale trade grew by 3.4 per cent and in motor vehicle trade by 8.4 per cent from one year ago. The sales volume of total trade increased by 3.2 per cent in July from July 2016. In the January to July period, sales went up by 1.8 per cent in retail trade and by 6.1 per cent in wholesale trade compared with the corresponding period of 2016. Sales in motor vehicle trade increased by 5.1 per cent over the same period. Total trade sales increased by 4.6 per cent from January to July 2016. The effects of the changes in the Tax Administration's self-assessed tax data have been analysed in Statistics Finland’s turnover indices. Based on the analyses, the changes have thus far not been found to have significant effects on enterprises’ VAT reporting in terms of statistics production. More information about this in Changes in the periodic tax return data used in turnover indices . ISSN=1799-0939. July 2017. Helsinki: Statistics Finland [referred: 22.4.2019].